One of the many strengths of our diverse kitchen are the local and regional specialties. Here I thought that, especially for the evening of Sinterklaas, I had covered all the food traditions: gevulde speculaas, taai-taai, kruidnoten and chocoladeletters. 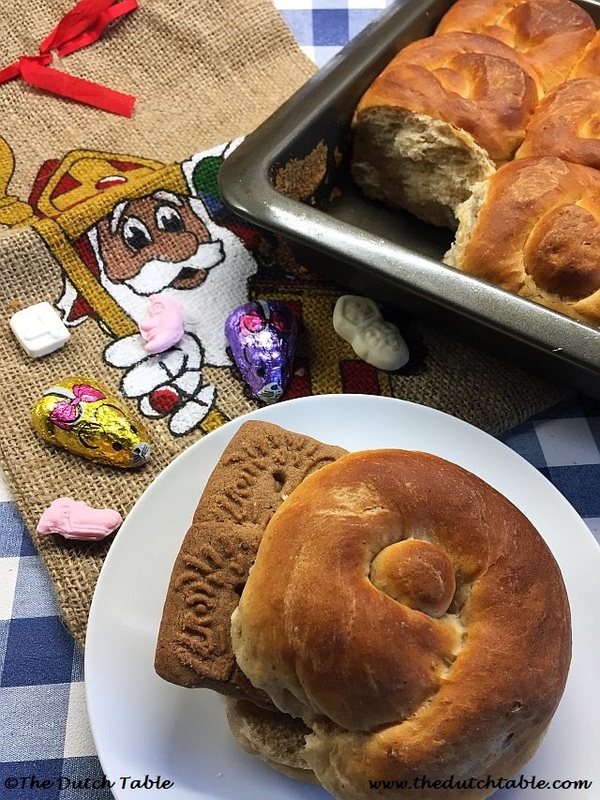 Imagine my surprise when I learned yesterday that in the province of Brabant, more specifically in and around the town of Veghel, Sinterklaas evening is not complete unless anijskrollen appear on the table. These anijskrollen, anise curls, are soft and tender white rolls, flavored with both ground anise and anise seed. People eat them buttered and layered with speculaas cookies, and with a mug of hot chocolate. Bakers in a twelve mile radius around Veghel start baking these krollen, presumably so called because the knot in the roll represents the curl in St Nicholas's crosier, right around the time the kermis makes it to Veghel in September, and continue to bake them until Carnaval, usually in February. The busiest time around these rolls is Sinterklaas, where local bakers sell thousands of the rolls a day. For many Veghel-ers and surrounding areas it's just not Sinterklaas without them! It is not clear when this tradition began, or why it is limited to just this particular region. Some people say that the anijskrollen have been sold in this area since the middle of the 19th century and found their origin in Veghel, but I have been unable to verify that claim. 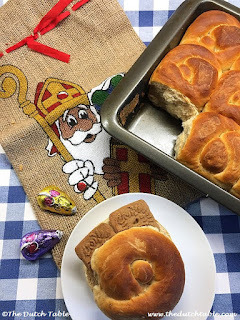 But the fact of the matter is that it is a popular practice now, and that many of those that were reared in this region or with this tasty tradition, consider it to be an important part of their Sinterklaas celebrations. So be it then, that tomorrow on Sinterklaas eve, we'll be gathered around the fireplace, ready to unwrap our presents, with a speculaas stuffed anijskrol in hand and hot chocolate within reach. Because, just because we weren't raised in this particular region of the country, shouldn't mean that we can't embrace new traditions and add them to our family's customs. Especially when it concerns these lovely, soft fluffy buns! If you can't find ground anise, just double up your amount of anise seeds, or crush one teaspoon of anise seeds in a mortar and pestle or your spice grinder. If you want a sturdier bun, you can also substitute 1 1/2 cup of all purpose for whole wheat flour. Sprinkle the yeast on top of the lukewarm milk (<110F/43C), and let it proof. In the meantime, mix the flour with the sugar and the anise and cinnamon. Add the milk when the yeast is proofed, the egg and the butter and knead it into a cohesive dough. Cover and let it rise for 30 minutes. Punch the dough down, and measure out 3 oz pieces. Roll each into a ball. You should be able to get 10 -12 rolls out of the mix. Now take each dough ball and roll it into a rope, about 7 inches long and tie it into a knot. Tuck one end of the rope under the roll, and have the other end come out on top. Grease a baking form (either square 9 x 9, or a 9 inch round springform cake pan) and place the knots in the pan. Cover and let them rise, at room temperature, for 50 minutes or until they are doubled in size and puffy. Heat the oven to 400F and bake the rolls for 15 minutes, or until their internal temperature registers 190F/88C and rising. After they've cooled, wrap in plastic to keep them soft. Recipe adapted from the Nederlands Bakkerijmuseum Het Warme Land - a must visit if you can!